When it comes to the interior designing of your bathrooms, then it should follow a systematic & coordinated process. It should involve ample research and analysis as well as the integration of proper knowledge into the creative process of designing a perfect dream bathroom. While designing the bathroom space, the selection and placement of the sanitary wares play a significant role in determining the overall look. When you would install the right sanitary ware in your bathroom, it can help in altering the entire theme and in introducing a fresh appearance into the space. This process is concerned with the detailed as well as the photographic survey of the existing along with the proposed drawing for fitting the sanitary products at the right places in your bathroom. With the help of advanced technology, 3D modeling has given the ease to the interior designers for developing models and then illustrating the same to the potential clients before the final installation is done. You can consider the same to be assured of the perfect design of your bathroom space. The sanitary wares play an important role in our daily lives. While selecting them, it is vital to consider the functionality aspect of your household and its members. In addition to this, it is also important to take into consideration the overall design of the sanitary products like Hindware sanitary to ensure stylish décor of your bathroom. The sanitary wares are available in a myriad of designs, colors, materials, as well as styles that could add luxury to the bathroom space. The sanitary products tend to be delicate items and thus, must be handled with care while sourcing and transporting them. You must also ensure the proper factory certification before installing them. The overall appearance of the sanitary unit should be shiny and functional enough to serve your purpose well. You must check into small flaws like minute cracks, chipped edges, or inconsistent tone to ensure that you are getting the right sanitary products. The installation of the sanitary wares in your bathroom is done only after the completion of major tasks like flooring, plumbing, drainage, fitting of windows, doors, and tiles. The water closet is usually fixed with the inlet as well as the outlet piping systems. It would prevent any leakages into your bathroom. During the installation of the bathroom sinks, it is important to make use of proper waterproof seals such that no leakages happen in future. The tub or the panel drain should be well connected to the waste pipe with the help of proper waterproof adapters. The joints located around the tub should be sealed with some waterproof sealant. For the shower panel and accessories, the hot and cold water points should be marked properly and then, tiling should be done. These must be installed at the right positions into the bathroom area. The waste pipes should also be fixed properly to avoid any leakage issues. 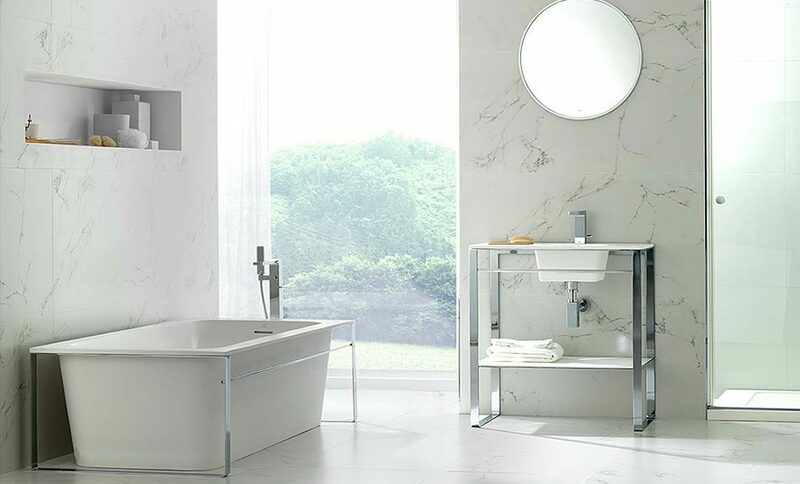 If you are designing a bathroom space in your home, then you should consider the important aspects like installation of sanitary ware and bathroom faucets properly into the same.